Being on a gymnastics team is very exciting and fun, but also intense. 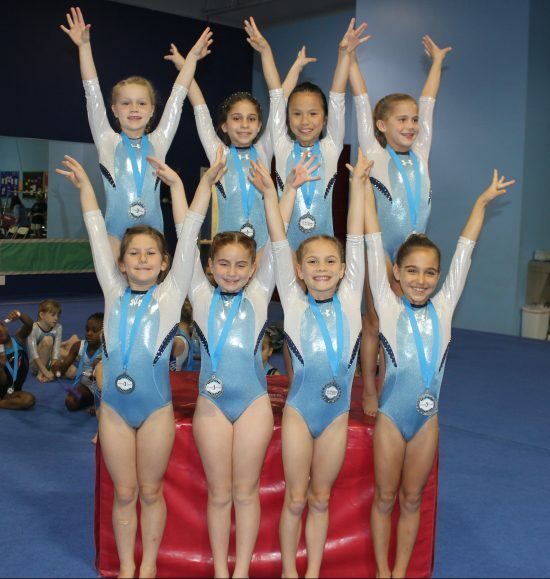 Competitive gymnastics is a year round sport and can be a major time and financial commitment for the child and the family. In addition to practice there is also a uniform fee and an annual booster club fee. When your child is invited to join team please make sure that this is something your family is ready to commit to. Your daughter will gain confidence, self discipline, friends and wonderful memories, but not without some sacrifices. Levels 1-5 are called compulsory which means the routines are determined by USA gymnastics and then slightly modified by AAU GA gymnastics. Levels 1-3 are not required and level placement is up to the coaches. USA Level 4 is required before moving to USA Level 5. Placement is made not just by a child’s skills, but also by their maturity. The routines in the higher levels become more complex and require more of a child mentally then just learning the skills. Please feel free to contact jsgteam@jumpstartgym.com if you have any further questions. Girls will spend the Fall learning skills and routines and then compete in 4-6 meets in December-April + state meet and 1-2 optional out of state meets.